Turtles from Outer Space, you say!? These knockoff ninjas certainly look the part. They are grimy to look at, but are kinda of cool. 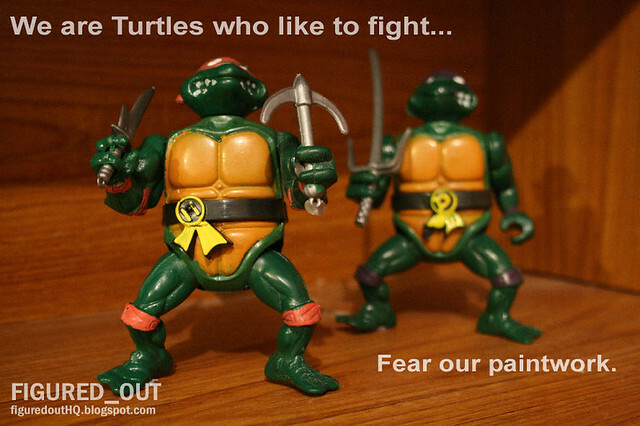 They are the Turtles Fighters! 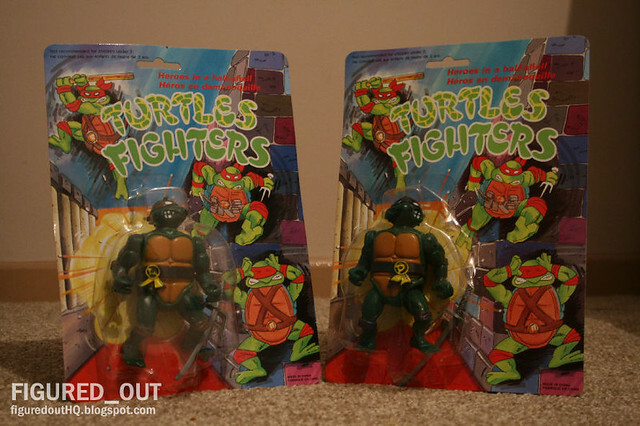 After some random searching I discovered a small ‘blast from the past’ in the form of the Turtles Fighters bootleg line. I had first owned a couple of these in 1991 (99p each) and it’s pleasant to see they are surfacing again (despite not being quite 99p as before). The figures are quite stable and hold together quite well. Each of them are duplicated from the bodysculpt of the original Playmates Raphael, but with different heads stuck on. 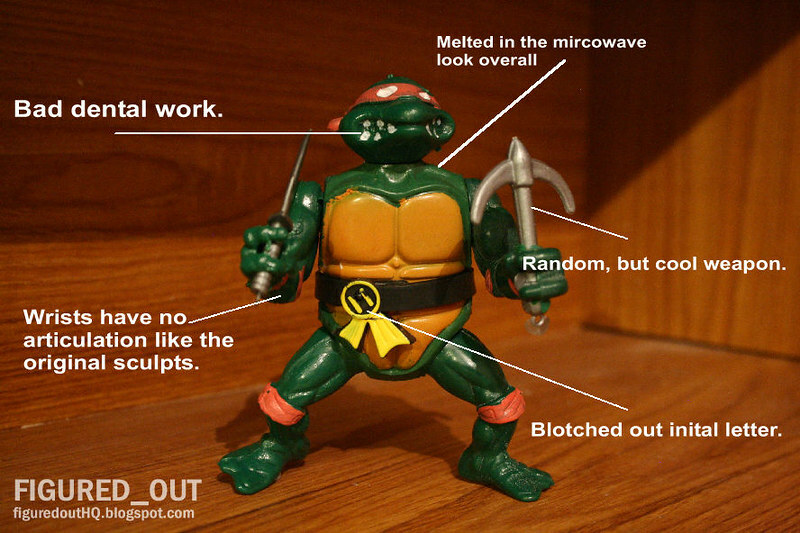 Every Turtle is accompanied with a random ninja weapon that looks to be copied from a non-TMNT toyline. The random weapons have ranged from a Nightstick, a sickle, a kusarigama and so forth. 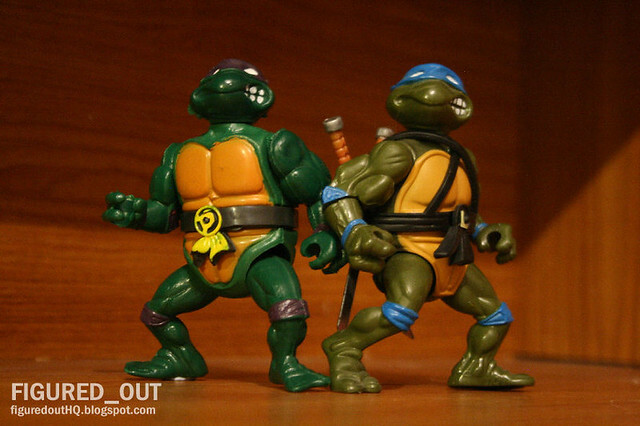 It has to be noted that the original Turtles Fighters I remember also had a range of altered head designs. These designs included shades moulded onto the face, a flattop haircut, and even a Mohawk! As well as altered heads, there was also different attire such as He-Man style armour. These newly surfaced toys so far have stuck to the basic TMNT bandana and initial belt design. The packaging remains the same as it did before, retaining the same artwork and custom logo. The paintjobs are just terrible! Even a pre-schooler can colour in the features in better than this. The teeth and eyes for example look like they have been hand painted and likely in rapid production. The colour schemes are dark in tone, and actually make great for being ‘dark’ dimension clones of Leo and co. 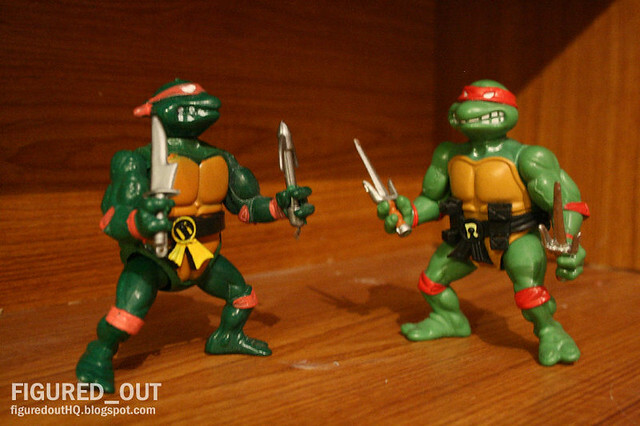 These ‘Turtles Fighters’ are also ideal templates for the fan who likes to do custom work at a low expense. Despite the many flaws, these are quite good as extras, customs, or whatever the imagination decides. 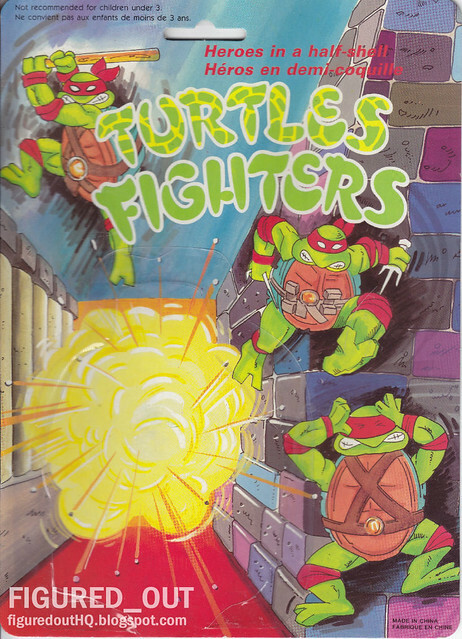 There is much worse tat roaming around, and the return of the Turtles Fighters after 20+ years at least poses some potential interest for the curious collector. These look terrible. How much are these? You mentioned they aren't 99p. They can't be more than £2-3 surely. Hi Sailor Sega. I've gotten these on eBay £5 for a set of 4. The Turtles Fighters mostly go for £2.50 (inc p&p) alone on most auctions.